Toni del Renzio. ARSON. AN ARDENT REVIEW. Part One of a Surrealist Manifestation. London, 1942. Toni del Renzio has died aged 91. Truer than life always, he was born to a landed Italian family outside St Petersburg, where his father was a diplomat to the Tsarist court. He had a legendary and varied life, not least in contributing to Studio International, with whose editor, Peter Townsend, he established a natural rapport. Fluent in several languages, he had fought in the Spanish Civil War but ended up in the lap of the Surrealist movement in Paris. On eventual arrival in London, he founded the Surrealist magazine Arson. In 1951 he joined the Institute of Contemporary Arts and was involved on exhibition panels and juries. For a time back in Italy, he became the Fashion Editor for Harpers Bazaar, and then reorganised the Milanese magazine Novita as Vogue Italia. He staggered his friends and acquaintances much later on by becoming, at the age of 70, the father of quadruplets, two sons and two daughters: and then wrote about it as if it was the most natural thing in the world, which for del Renzio, it was. His métier was the surrealist collage. He became distinguished as a teacher, both at Bath and subsequently at Canterbury, where he was Head of Art and Design History. Vale, ti saluto, Toni del Renzio, maestro. Antonio Romanov del Renzio dei Rossi di Castelleone e Venosa (to give him his full name) was a mercurial character and as a surrealist spent a lot of time engaged in aesthetic and political arguments, being at one time being considered a monster by the Mesens crowd. His key work 'Arson' was partially financed by Ithell Colquhoun whom he married in 1943 and divorced in 1948. He was also, briefly, the lover of the surrealist painter Emmy Bridgwater. In 1942 he also mounted a London exhibition entitled Surrealism resulting in more general recognition for the movement. 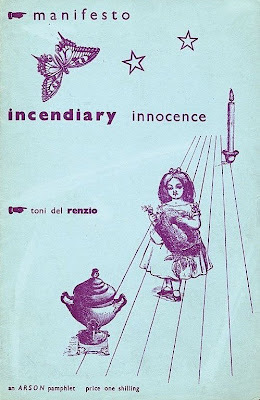 'Arson' was printed on turquoise stock and decorated on the front cover with surrealistic appropriations of steel engravings, printed in purple. 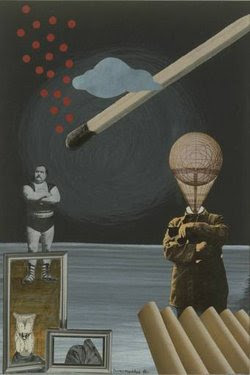 Collage was a favourite medium for del Renzio. Contributors included Robert Melville, Giorgio de Chirico, Conroy Maddox, Nicolas Calas, Pierre Mabille + an interview with André Breton. Books by TDR are quite collectable--his 1968/ 1969 paperback on hippies 'The Flower Children' (no copies anywhere) must be worth £30 by now and his 1971 book 'After a Fashion' is highly elusive. VALUE? A copy of Arson, not nice but complete, went through Ebay earlier this year at $199. There are 2 copies at ABE as we speak at £300 (call it $600) neither fine and one with chips at the edges. It probably sells easily at $300. £300 may be achievable as you have to have it if you collect British surrealism. The entire printed output of the British cadre of the movement would probably fit in one regular book box. I guess the top book would be Nancy Cunard's 'Salvo for Russia' also London, 1942. It was co-edited by the artist John Banting. 100 copies printed, last auction record £130 in 1976. I want it. Outlook? Unknowable, search me guv etc., Pressed for an opinion I would say healthy - because it's quirky, visual and ephemeral. Below is a pic (mixed media and watercolour on paper) by the equally longlived (Birmingham) surrealist Conroy Maddox from 1940, that gives a flavour of the movement. The Christmas Cookie Sprinkle Snitcher, 1969. Theory of the Leisure Class. Veblen, 1899.